Hey guys, good news for you all who use Azure SQL Database. Now we are free to use the CASE expression, the CROSS APPLY operator, and all JSON functions, isn't it interesting! Microsoft keeps adding more and more security features in Azure and the latest addition to that is the Azure "Storage Service Encryption"
Today we will see how to enable the Azure storage encryption. Within 3 to 4 clicks we will be able to encrypt the storage account. Lets login to the Azure account first. Once you login click on the "Storage Accounts" Menu. New blade will be opened with all the available storage account you have created. Now you select the storage account you want to encrypt, you will find the Encryption option, just click on the "Encryption" option. Here in the right pane you will be able to Enable or Disable the Encryption. 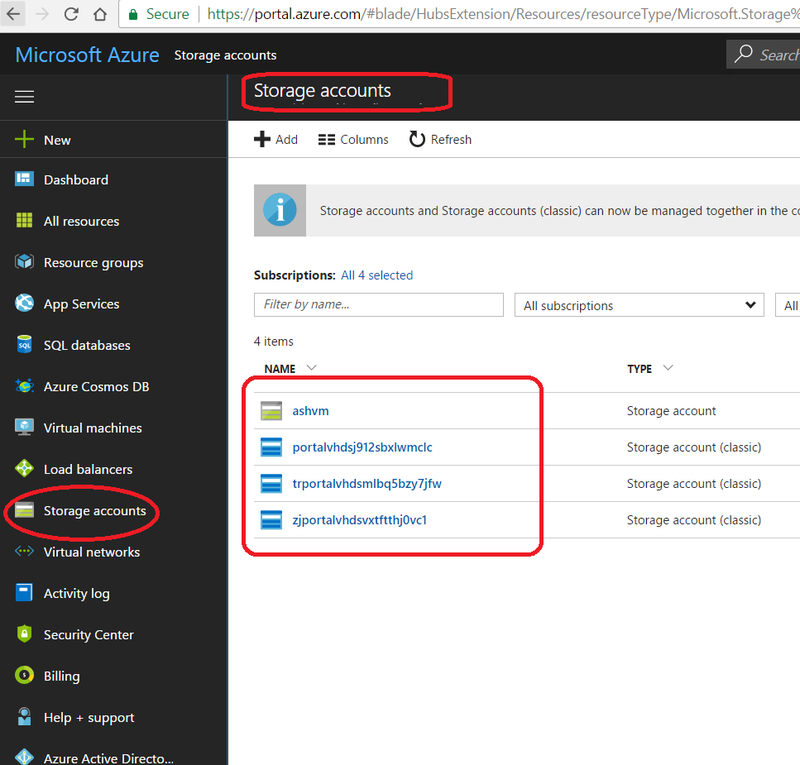 At present this feature is available for Azure Blobs and Files. But nothing to worry more options are going to come soon. Also you need to keep it in your mind that once you Enable the encryption only new Data will be encrypted, all the existing files will remain as it is. Thanks for visiting my blog, please leave your comment below. First let me ask you a question, what is Toastr.js and what is the use of it? Lets start with a very simple .net application with one label, textbox and a button. Then on click of the button we will show the Toastr alert. First we need to add the Toastr library like below in your .aspx page. Here you might have noticed that I am referring the path directly from the online URL. In your case you may download the toast.js and toastr.css and also the jQuery and refer it internally. Now we will write the code to show the alert. On click of the button Toastr message will be shown like below. You can have a condition based on your requirement to show the alert. Here I didn’t show that because everyone got their on requirement. You have many option to show different color, different title and different icon depends on the message. Similarly you have toastr.info and toastr.warning to show the alert. Another useful option you may require is the position where you want to show the alert. I hope you enjoyed reading this article. Please try this in your project and let me know your client feedback. I am sure they will definitely like this. This is one of the very common error we use to get while using Oracle database. The error “The underlying provider failed to open” is bit confusing if you are not able to view the inner exception. Once you get the exception, just expand the exception try to read the inner exception. Whihc will be more clear than this. I just exapanded the exception and the actual error we get is “ORA – 12154: TNS:could not resolve the conect identifier… ” If you read this exception it will be more clear and you might know what needs to be done. Below is the screen print of the error. So in order to resolve the error “ORA – 12154: TNS:could not resolve the conect identifier…” you have to copy three files to the oracle installation location. Oracle installation folder may vary depends on where you have installed the software and the windows version. I have given you two possible location normally oracle get installed. If you cannot find Network and Admin folder in Client_1 path you may create those two folders. Now you try to run the code and see if the issue gets resolved or not. I hope it helps you to resolve the issue. Thanks you for visintg my blog. This is one of the very strange error you may find sometimes. Especially when you build a new system or when you install visual studio 2013 first time. There are many reasons for this error. If you search in Google you may find many solutions here I am going to give you a different solution which worked for me after a thorough investigation. What happened in my case was, when I open Visual Studio 2013 it shows as running in Administrator mode, but actually it is not. I didn’t right click and run as administrator while opening Visual Studio. Now if you build your application which require administrator rights your build may fail. Again not always and not all projects. So to resolve this issue what you have to do is open Visual Studio in Administrator mode. Just right click on the Visual Studio 2013 from the start menu and click on Run as Administrator. Now you try to build the project which failed without any error. It must work. I hope it helps, as I mentioned at the top this is not the only solution to this problem, but this is definitely one of the solution which worked for me. So thought of sharing with you all. We are starting webinar in DotNetSpider. You may find many good technical sessions soon from DotNetSpider. Fist webinar will be presented by Mr.. Gaurav Arora who is one of the senior member of DotNetSpider. Request all my readers to make use of this opportunity. We will be soon coming up with Azure series…wait and watch. Please joined this session on 28th June 8:00 PM to 9:30 PM. You may just open the below link to join this session. “Could not load file or assembly 'Oracle.DataAccess' or one of its dependencies. An attempt was made to load a program with an incorrect format” is an error which you get while hosting the WCF service in IIS. Exception Details: System.BadImageFormatException: Could not load file or assembly 'Oracle.DataAccess' or one of its dependencies. An attempt was made to load a program with an incorrect format. You get this error normally when you try to host a WCF service developed in Windows 32 bit machine and you are trying to host this in a 64 bit machine. Solution to this issue is a simple one, you just need to change the settings in IIS to enable 32 bit application hosting. Lets see the step step by actions to change this settings. Open IIS --> Press Start button + R and then type inetmgr. In Advance Settings dialog change the Enable 32-Bit Applications settings from False to True and Click OK.
Now you browse your WCF service and see the result. I am sure your error would have disappeared. This is one of my favorite interview question. I hope you also would have faced this question, if not then there is a high possibility that you may face it soon! Answer to the question Can we insert explicit values into IDENTITY column is MS SQL is YES. You can insert values into the IDENTITY column as you require. Lets start step by step. Table is ready, now we will insert some values to the above table. Above is the standard way to insert the values into the table which has IDENTITY column. Cannot insert explicit value for identity column in table 'DemoIdentity' when IDENTITY_INSERT is set to OFF. Yes, now we will see the property which MS SQL provides you to insert values in IDENTITY column. In SQL we have the property named IDENTITY_INSERT. Whenever you wanted to insert values to an IDENTITY column we just need to enable the property IDENTITY_INSERT. Lets enable this property and insert a value in above table. Now we will insert the value by executing the same above statement by specifying the IDENTITY column value and see the result. One important thing you have to remember is, in order to enable or disable the IDENTITY_INSERT property you should be part of the sysadmin group. Make sure you disable the IDENTITY_INSERT ON once you are done with the insert statement as this column is not intended to insert the values explicitly. I hope now you understood the whole concept of the property IDENTITY_INSERT and how you can insert explicit values into an IDENTITY column. This is one of the most confusing error you get while hosting WCF service in IIS. Solution is simple but the error description completely misleads you to think in all the direction. The reason for the error is when you host a WCF service which is developed in .NET Framework 4.0 or 4.5 then while deploying by default IIS select .NET Framework 2.0. In order to resolve this issue go to IIS and change the .NET Framework to the version which was used to develop your WCF service. Press Start button + R and then type inetmgr. In the list of application pools select the application pool which is being used by your new WCF service. Here you would have already noticed the wrong framework associated with your WCF service. Just double click on the WCF Service name and change the .NET Framework version. Click OK to save the changes. Now you browse your WCF service all your issues with your WCF service hosting error would have resolved. Where to find log files for the ASP.NET web application hosted in Windows Azure? If you are a developer then definitely one of the question haunting you once you deploy your web application in Windows Azure is where is the log file? How can I go through the default log files which we have in IIS or in any other web server. In this article all your such query will be answered. Once you login to your windows Azure account and open the web application configuration section you will find the option to configure all the log files, but there is no options available there to download or to view the log files. You may find all below options under Configure Menu but not the option to view the log files. Lets see the available options to view the log files. There are two ways you can view the log files related to your web applications deployed in Windows Azure. 1. Kudu Console. If you are hearing this first time then you may read my earlier article “What is KUDU” Once you open KUDU console you just need to go to the Tools menu and then you will find an option “Diagnostic dump” By clicking on this item will download the whole log files dump in your local system. Once you have the dump then nothing more to write about what you have to do. 2. Using Visual Studio: This one is interesting as you will be seeing the log files from your Visual Studio itself. In order to view the log files first you need to connect your Visual Studio with your Windows Azure account. If you are not aware of this feature, I have already written an article for you “Visual Studio In-built Support for Windows Azure”. Once you connect to your Visual Studio to your Windows Azure account then Expand Azure—>Websites—>Now expand the website name which you wanted to view the log files. As soon as you expand your website which you wanted to view the log files you might have noticed a folder named “Log Files” This is our target today. Lets expand the files and see the subfolders inside Log Files. One thing you have to remember is this folder structure under log files in totally depends on the logging mechanism you have enabled for your application. If you have enabled all the available logging then you may find many folders for each logs. For your information I have expanded few of my already deployed in applications in my Windows Azure account. Try to pen each log files under each folder if you like to explore more about the log files. I hope you are now clear about the available log files in Windows Azure and how you can download or view this log files for debugging the issues. Thanks a ton for reading my article and I hope it will help in your application development. As usual you are always welcome to give feed back to my articles which may help me to improve next time. Today we will go through one of the new feature added in .NET framework 4.5.1. This feature is currently available only in Windows Server 2012 R2. Microsoft may add this in other operating systems later but currently this is restricted to Windows Server 2012 R2. App Suspend is a new configuration in IIS in Windows Server 2012 R2. We will see what is the advantage we are going to get if use this configuration and also will see where we have to change this configuration. First thing first! What is the advantage of using app suspend? If you enable this great feature your application start up will be much faster and in single webserver server you can host multiple application without impacting the performance. Now, lets see how enable this feature. In order to enable first we will open IIS from your Windows Server 2012 R2. Open IIS—> Select Application Pools—> Right Click on Application Pools and then select the “Advance Settings…”. In advanced Settings window you will not see this feature anywhere! isn’t it? Yes you cannot see this feature directly. This feature is part of the “Idle Time-out” settings. You would have noticed a special configuration here that is nothing but the “Idle Time-Out Action” this is currently available only Windows Server 2012 R2. This is the configuration we have to change. By default it will be selected as “Terminate”. Just click on this dropdown to see that the new option “Suspend”. and select the same and click on OK to return. That’s all you have to do, you are done!!! If you like to test this feature then change the default time to 2 min or something and access the application. Also change the setting back to terminate and see your application start up time difference. I hope you understood the advantage of this App Suspend feature and you will try this in your application. As you are aware Visual Studio has evolved a lot and every new release Microsoft adds many features. Since Windows azure is the hot cake in the market, of course Microsoft added many inbuilt features in Visual Studio 2013. Today we are going to explore few important features which will help you to debug your application. Lets go through one by one, lets connect to Windows Azure website form Visual Studio. Now you can directly connect to your Azure website from Visual Studio. IN order to connect to the windows azure, first you need to sign in to your Azure account. If you are already connected then you can directly open the server explorer form View Menu. Once you open Server Explorer, you can find an option named “Azure”. You may expand the Azure to find the available options under that. This links nothing but what you see once you login to your Azure account. You can compare the feature list below. Except Visual Studio online everything can be found there. Visual Studio online is a different configuration so that is available under Team explorer in Visual Studio. Now what we are going to explore is the features available under Websites. Lets expand the Websites, you will notice that all the websites which is already hosted in your Azure account will listed there. We will concentrate on one website now and will see what we can do directly from Visual Studio. Lets right click on one website and select View Settings. You will be amazed to see the options which is opened in your right panel. Lets explore one by one now. First one you would see is the Stop Website and Restart Website. If the website is in the stopped state you will find an option Start Website in place of Stop Website. As you are aware you stop the application inn windows Azure as well same like the way you do it in IIS. I believe nothing more to explain this feature as it has got its literal meaning. Next options which shows under Website Settings are mainly for debugging. You may choose the framework version depends on the one you want to run your application. Next four settings are related to remote debugging. You may enable all or the require logging options in case you are facing any issues with the application. It is very easy to know what exactly is the issue your application is facing by going through this log files. As soon as you change this logging options it will reflect in Windows Azure as well. Which means instead of logging-in to your windows Azure account you may manage all these options from Visual Studio itself. I will be stopping today, there are much more to explain about the log files which you are going to get by enabling this logging mechanism. I will be writing a separate articles for each logs. Thanks a lot of reading my article.